سازند سروک به‌عنوان یکی از مخازن مهم هیدروکربوری ایران هدف اصلی این مطالعه است. در این پژوهش ارزیابی کیفیت مخزنی سازند سروک با استفاده از تلفیق مطالعات سنگ‌نگاری و داده های تخلخل- تراوایی مغزه در ۳ چاه مهم در یکی از میدان‌های بزرگ ناحیه دشت آبادان در جنوب باختری ایران صورت گرفته است. مطالعات سنگ نگاری به شناسایی ۱۳ ریزرخساره در قالب 3 کمربند رخساره ای اصلی شامل لاگون، پشته‌های بیوکلستی زیرآبی (شول)، دریای باز شامل تالوس و شیب در چارچوب یک مدل سکوی کربناته ایزوله انجامید. فرایندهای دیاژنزی چیره شامل میکرایتی شدن، زیست آشفتگی، تبلور دوباره، انحلال، سیمانی شدن، تراکم فیزیکی و شیمیایی، دولومیتی شدن، جانشینی (پیریت، سیلیس و گلوکونیت) و شکستگی توالی سازند سروک را تحت تأثیر قرار داده اند. بر پایه نتایج حاصل، کیفیت مخزنی سازند سروک حاصل تأثیر رخساره های رسوبی به‌صورت اولیه و فرایندهای دیاژنزی به‌صورت ثانویه است. ارزیابی تأثیر رخساره های رسوبی بر کیفیت مخزنی نشان می‌دهد که توالی های رودیست دار (به‌ویژه زون های واریزه رودیستی) کیفیت مخزنی بالایی دارند. انحلال و سیمانی شدن مهم‌ترین فرایندهای دیاژنزی مؤثر بر سازند سروک هستند که به دلیل تأثیر چیره فرایندهای دیاژنزی جوی رخ ‌داده‌اند. انحلال و شکستگی عوامل اصلی افزایش تخلخل- تراوایی و سیمانی شدن و تراکم مهم‌ترین عوامل کاهش کیفیت مخزنی در سازند سروک هستند. این مطالعه می تواند به شناخت بهتر عوامل کنترل‌کننده کیفیت مخزنی سازند سروک در ناحیه دشت آبادان بیانجامد. The Sarvak Formation is one of the most important carbonate reservoirs of Iran. The main objective of this study is to evaluate reservoir quality of the formation by integration of petrographic studies and core porosity-permeability data in three key wells in a giant oilfield of the Abadan Plain, SW Iran. Petrographic studies led to the identification of 13 microfacies that are grouped into three main facies belts including lagoon, shoal, and open marine (talus and slope) which deposited in an isolated carbonate platform. The main diagenetic processes affecting the Sarvak Formation are micritization, bioturbation, recrystallization, dissolution, cementation, physical and chemical compaction, dolomitization and silicification, along with fracturing. According to the results, the reservoir quality of the Sarvak reservoir is a function of both primary depositional facies and secondary diagenetic processes. Evaluation of impacts of depositional facies on reservoir quality indicated that the rudist-bearing intervals (especially rudist debris zones) have high reservoir quality. Dissolution and cementation are the most pervasive diagenetic processes affecting the formation, and occurred due to widespread meteoric diagenesis. Dissolution and fracturing are the chief factors that lead to the improvement of porosity-permeability, whilst calcite cementation and compaction have destructed reservoir quality of the studied interval. This study may assist better understand the geological parameters controlling reservoir quality of Sarvak Formation in the Abadan Plain oilfields. آقانباتی، س. ع.، 1392- زمین‌شناسی ایران و کشورهای هم‌جوار، سازمان زمین‌شناسی و اکتشافات معدنی کشور، 676 ص. اسعدی، ع.، هنرمند، ج.، معلمی، س. ع. و عبداللهی فرد، ا.، 1395- تأثیر فرآیندهای دیاژنزی بر کیفیت مخزنی بخش بالایی سازند سروک در یکی از میادین دشت آبادان، جنوب غرب ایران، فصلنامه علمی- پژوهشی پژوهش های چینه نگاری و رسوب شناسی اصفهان، سال سی و دوم، شماره 62، ص. 57 تا 79. خانجانی، م.، موسوی حرمی، س. ر.، رحیم‌پور بناب، ح. و کمالی، م. ر.، 1393- محیط رسوبی، دیاژنز و چینه‌نگاری سکانسی بخش بالایی سازند سروک (معادل میشریف) در میادین نفتی سیری، فصلنامه علمی-پژوهشی علوم زمین، سال بیست و چهارم، شماره 94، ص. 263 تا 274. شاهوردی، ن.، رحیم‌پور بناب، ح.، کمالی، م. ر. و اسرافیلی دیزجی، ب.، 1394- محیط رسوبی، دیاژنز و کیفیت مخزنی بخش بالایی سازند سروک در خلیج‌فارس، فصلنامه علمی- پژوهشی علوم زمین، سال بیست و پنجم، شماره 98، ص. 55 تا 66. فرامرزی، س.، رحیم پوربناب، ح. و رنجبران، م.، 1394- بازسازی توالی فرایندهای دیاژنزی در بخش بالایی سازند سروک در یکی از میدان‌های جنوب باختر ایران. کارگاه های آموزشی و سی و چهارمین گردهمایی و دومین کنگره بین‌المللی تخصصی علوم زمین، ایران-تهران. مطیعی، ه.، 1372- زمین‌شناسی ایران، چینه‌شناسی زاگرس، سازمان زمین شناسی کشور، 536 ص. 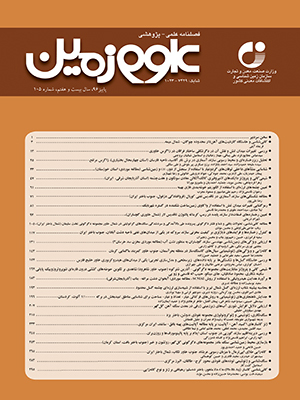 وزیری مقدم، ح. و صفری، ا.، 1382- بررسی رخساره های آهکی و تفسیر محیط رسوب گذاری سازند سروک در ناحیه سمیرم، مجله پژوهشی علوم پایه دانشگاه اصفهان، شماره 2، دوره هجدهم، ص. 59 تا 74. Abdollahie Fard, I. A., Braathen, A., Mokhtari, M. and Alavi, S. A., 2006- Interaction of the Zagros Fold–Thrust Belt and the Arabian-type, deep-seated folds in the Abadan Plain and the Dezful Embayment, SW Iran. Petroleum Geoscience, v. 12, no. 4, p. 347-362. Ahr, W. M., 2008- Geology of carbonate reservoirs. John Wiley and Sons, Chichester, 296 p.
Alavi M., 2004- Regional stratigraphy of the Zagros fold-thrust belt of Iran and its pro-foreland evolution. Am J Sci v. 304, p. 1-20. Alavi, M., 2007- Structures of the Zagros fold-thrust belt in Iran. American Journal of Sciences, v. 307, p. 1064–1095. Aqrawi, A., Mahdi, T., Sherwani, G. and Horbury, A., 2010- Characterization of the Mid-Cretaceous Mishrif Reservoir of the southern Mesopotamian Basin, Iraq. In: American Association of Petroleum Geologists Conference and Exhibition, v. 7, p. 7-10. Assadi, A., Honarmand, J., Moallemi, S. A. and Abdollahie-Fard, I., 2016- Depositional environments and sequence stratigraphy of the Sarvak Formation in an oil field in the Abadan Plain, SW Iran. Facies v. 62, no. 4, p. 26. Bosence, D., 2005- A genetic classification of carbonate platforms based on their basinal and tectonic settings in the Cenozoic. Sedimentary Geology v. 175, no 1, p. 49-72. Carannanate, G., Ruberti, D. and Sirna, M., 2000- Upper Cretaceous low-energy ramp limestones from the Sorrento Peninsula (southern Apennines, Italy): micro and macrofossil associations and their significance in the depositional sequences. Sedimentary Geology, v. 132, p. 89-124. Dickson, J. A. D., 1966- Carbonate identification and genesis as revealed by staining. Journal of Sedimentary Petrology, v. 36, no. 2, p. 491-505. Dunham, R. J., 1962- Classification of carbonate rocks according to depositional texture. In: Ham, W.E. (ed. ), Classification of carbonate rocks American Association of Petroleum Geologists, Memoir, 1: 108-121. Embry, A. F. and Klovan, J. E., 1971- A Late Devonian Reef Tract on Northeastern Banks Island, N.W.T. Bull. Can. Petrol. Geol. v. 4, no. 19, p. 730-781. Esrafili-Dizaji, B., Rahimpour-Bonab, H., Mehrabi, H., Afshin, S., Harchegani, F. K. and Shahverdi, N., 2015- Characterization of rudist-dominated units as potential reservoirs in the middle Cretaceous Sarvak Formation, SW Iran. Facies, v. 61, no. 3, p. 1-25. Flügel, E., 2010- Microfacies of carbonate rocks. Springer-Verlag, Berlin, 976 p.
Ghabeishavi, A., Vaziri-Moghaddam, H., Taheri, A. and Taati, F., 2010- Microfacies and depositional environment of the Cenomanian of the Bangestan anticline, SW Iran. J Asian Earth Sci, v. 37, p.275-285. Hajikazemi, E., Al-Aasm, I. S. and Coniglio, M., 2010- Subaerial exposure and meteoric diagenesis of the Cenomanian-Turonian Upper Sarvak Formation, southwestern Iran. In: Leturmy, P. and Robin, C. (Eds), Tectonic and Stratigraphic Evolution of Zagros and Makran during the Mesozoic–Cenozoic, Geological Society, London, Special Publications v.330, no. 1, p. 253-272. Hajikazemi, E., Al-Aasm, I. S. and Coniglio, M., 2012- Chemostratigraphy of Cenomanian–Turonian carbonates of the Sarvak Formation, Southern Iran. Journal of Petroleum Geology, V.330 no,1, p. 187-205. Heckel, P. H., 1972- Possible inorganic origin for stromatactis in calcilutite mounds in the Tully Limestone, Devonian of New York. Journal of Sedimentary Petrology, v. 42, no. 1, p. 7-18. Hollis, C., 2011- Diagenetic controls on reservoir properties of carbonate successions within the Albian–Turonian of the Arabian Plate. Petroleum Geoscience, v. 17, no. 3, p. 223-241. James, G. A. and Wynd, J. G., 1965- Stratigraphic nomenclature of Iranian oil consortium agreement area. American Association Petroleum Geologists, v. 49, no.12, p. 2182–2245. Lucia, F. J., 2007- Carbonate Reservoir Characterization: an Integrated Approach. Springer, Berlin, New York, 336 p.
Mehrabi, H. and Rahimpour-Bonab, H., 2014- Paleoclimate and tectonic controls on the depositional and diagenetic history of the Cenomanian-early Turonian carbonate reservoirs, Dezful Embayment, SW Iran. Facies v. 60, no. 1, p. 147-167. Mehrabi, H., Rahimpour-Bonab, H., Hajikazemi, E. and Jamalian, A., 2015- Controls on depositional facies in Upper Cretaceous carbonate reservoirs in the Zagros area and the Persian Gulf, Iran Facies, v. 61, p.1-24. Moore, C. H. and Wade, W. J., 2013- Carbonate reservoirs: porosity, evolution and diagenesis in a sequence stratigraphic framework: Porosity Evolution and Diagenesis in a Sequence Stratigraphic Framework, Second edition, Elsevier, 369 p. 444. Pomar, L., 1991- Reef geometries, erosion surfaces and high-frequency sea-level changes, upper Miocene Reef Complex, Mallorca, Spain. Sedimentology v. 38, no. 2, p.243-269. Pomar, L., 2001- Types of carbonate platforms: a genetic approach. Basin Research v. 13, no. 3, p. 313-334. Rahimpour-Bonab, H., Mehrabi, H., Enayati-Bidgoli, A. H. and Omidvar, M., 2012- Coupled imprints of tropical climate and recurring emergence on reservoir evolution of a mid-Cretaceous carbonate ramp, Zagros Basin, southwest Iran. Cretaceous Research, v. 37, p. 15-34. Rahimpour-Bonab, H., Mehrabi, H., Navidtalab, A., Omidvar, M., Enayati-Bidgoli, A. H., Sonei, R. and Izadi Mazidi, E., 2013- Palaeo exposure surfaces in Cenomanian–Santonian carbonate reservoirs in the Dezful embayment, SW Iran. Journal of Petroleum Geology, v. 36, no. 4, p. 335-362. Razin, P., Taati, F. and Van Buchem, F. S. P., 2010- Sequence stratigraphy of Cenomanian–Turonian carbonate platform margins (Sarvak Formation) in the High Zagros, SW Iran: an outcrop reference model for the Arabian Plate. In: van Buchem, F. S. P., Gerdes, K. D. and Esteban, M. (Eds), Mesozoic and Cenozoic Carbonate Systems of the Mediterranean and the Middle East: Stratigraphic and Diagenetic Reference Models, Geological Society, London, Special Publications v. 329, no. 1, p. 187-218. Ross, D. J. and Skelton, P. W., 1993- Rudist formations of the Cretaceous: a palaeoecological. sedimentological and stratigraphical review. Sedimentology Review/1: 73-91. Sepehr, M. and Cosgrove, J. W., 2005- Role of the Kazerun fault zone in the formationand deformation of the Zagros fold thrust belt, Iran. Tectonics 24: TC5005-1-TC5005-13. Setudehnia, A., 1978- The Mesozoic sequence in south-west Iran and adjacent areas. J Pet Geol 1: p 3–42. Sharland, P. R., Archer, R., Casey, D. M., Davies, R. B., Hall, S. H., Heyward, A. P., Horbury, A. D. and Simmons, M. D., 2001- Arabian plate sequence stratigraphy. GeoArabia, Special Publication 2, 371 p.
Sharp, I., Gillespie, P., Morsalnezhad, D., Taberner, C., Karpuz, R., Verge’s, J., Horbury, A., Pickard, N., Garland, J. and Hunt, D., 2010- Stratigraphic architecture and fracture controlled dolomitization of the Cretaceous Khami and Bangestan groups: an outcrop case study, Zagros Mountains, Iran. In: Van Buchem, F. S. P., Gerdes, K. D. and Esteban, M. (Eds), Mesozoic and Cenozoic Carbonate Systems of the Mediterranean and the Middle East: Stratigraphic and Diagenetic Reference Models Geological Society, London, Special Publications v. 329, p.333-396. Taghavi, A. A., Mork, A. and Emadi, M. A., 2006- Sequence stratigraphically controlled diagenesis governs reservoir quality in the carbonate Dehluran field, SW Iran. Petroleum Geoscience, v. 12, p. 115-126. Tucker, M. E. and Wright, V. P., 1990- Carbonate Sedimentology. Blackwell Scientific Publications, Oxford, UK, 482 p.
Van Buchem, F. S. P., Simmons, M. D., Droste, H. J. and Davies, R. B., 2011- Late Aptian to Turonian stratigraphy of the eastern Arabian Plate–depositional sequences and lithostratigraphic nomenclature. Petroleum Geoscience, v. 17, no. 3, p. 211-222. Wilson, J. L., 1975- Carbonate Facies in Geologic History. Springer-Verlag, New York, 471 p.
Zhicheng, Z., Willems, H. and Binggao, Z. 1997- Marine Cretaceous-Paleogene biofacies and ichnofacies in southern Tibet, China, and their sedimentary significance. Marine Micropaleontology, v. 32, no. 1, p. 3-29.